I’m not sure how the world survived before sticky notes. I use sticky notes to keep track of to do tasks and as reminder notes. I’m very protective of my stock of pretty sticky notes because I’m so reliant on using sticky notes to keep organized and to motivate. I created my own Daily To Do List Printable for sticky notes that I use every day. I have terrible handwriting and want to be able to print out pretty notes and reminders. I figured out how to print on sticky notes and it’s really easy to do. Really. I can remember when Post-It Notes first came out. It was revolutionary. Even though back then they only came in pale yellow, they were still ah-mazing! Now sticky notes are available in so many different sizes and colors. I get a bit giddy even thinking about it. Recently I wanted to print my own text out on sticky notes to use. That was my motivation to figure out how to print on sticky notes for myself. 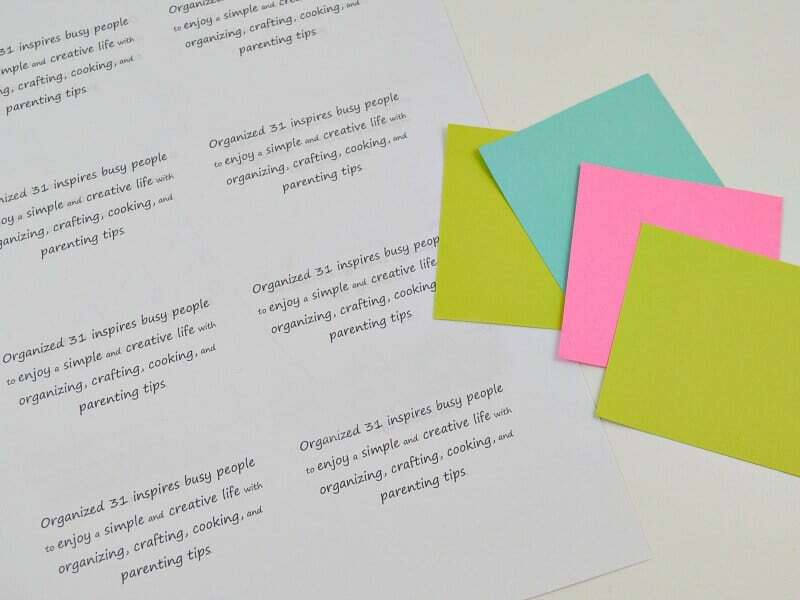 SuppliesSticky Notes – You can use any size, but it’s easiest to use 3×3 or 4×4 inch notes when you’re first starting. One Sheet of Printer Paper – I reuse oops paper and recycle it. You’re only printing on it as a guide for where to place your sticky notes, so you can use recycled paper. 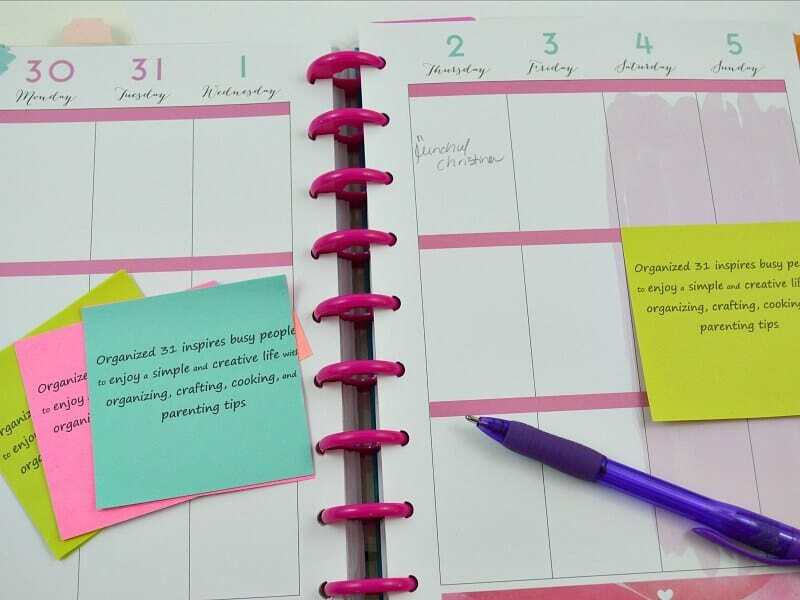 Make your personalized sticky notes work perfectly in your favorite planner. Mine is the Happy Planner, but my sister-in-law loves the Erin Condren planner. Make sure you can see both of the rulers for your document. Format your word processing document in two columns the width of your sticky note. Type your text and make sure that it fits within the dimensions of your sticky notes. My sticky notes were 3 inches by 3 inches, so I made sure my text remained in that area. Repeat your text so that it covers the paper. Remember to stay within your sticky note dimensions. Check that several times before you hit print. 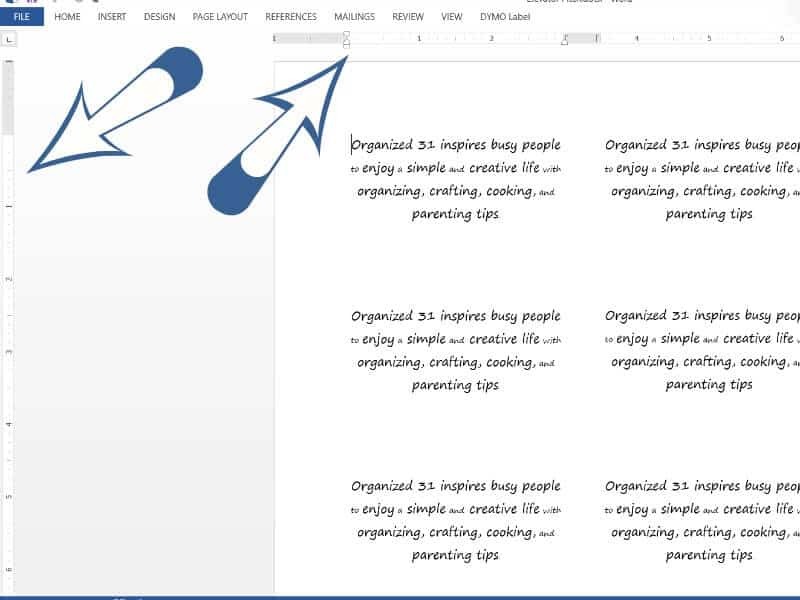 Print your document out on your page. Double-check again to make sure that the printed area fits within your sticky note area. Place your sticky notes over the printed area. 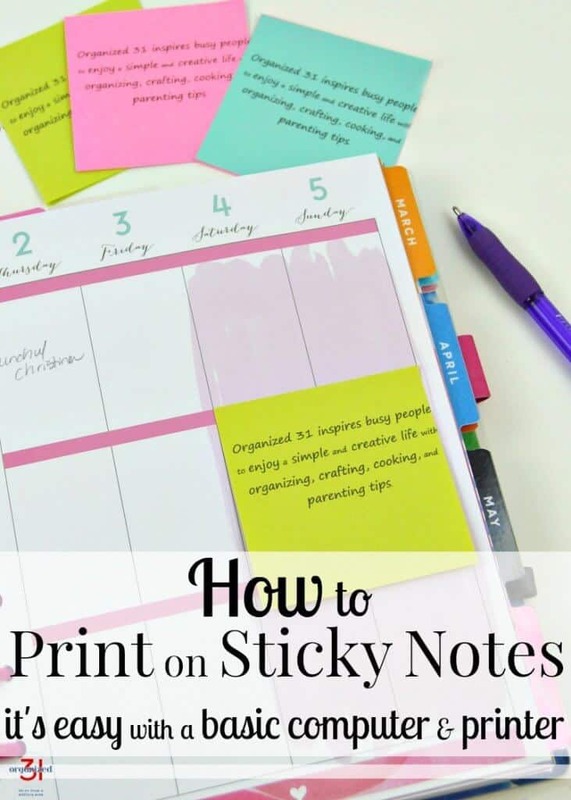 Stick each row onto the bottom of the previous sticky note to help hold it in place. When you reach the last sticky note, use a small piece of tape to hold the bottom of the last sticky note in place. 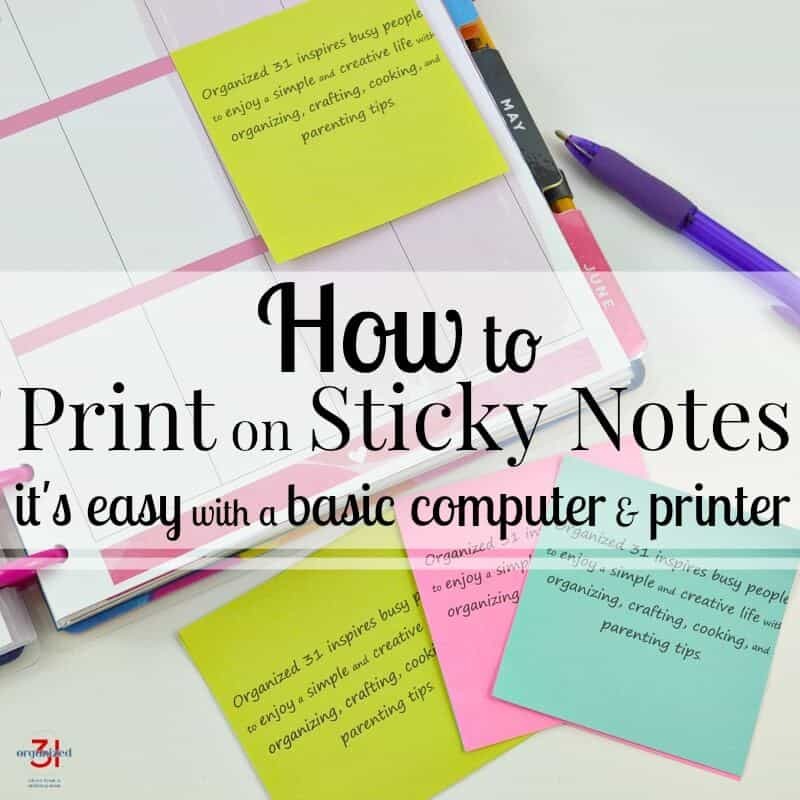 Place your sticky note paper into your printer and print out your document. Voila! You now have your own note printed out on your sticky notes. I think I’ve found a new addiction. It’s so easy to do. It takes approximately 5-10 minutes. And once you’ve figured out how to set up the spacing on your first document, writing new notes will go much more quickly. 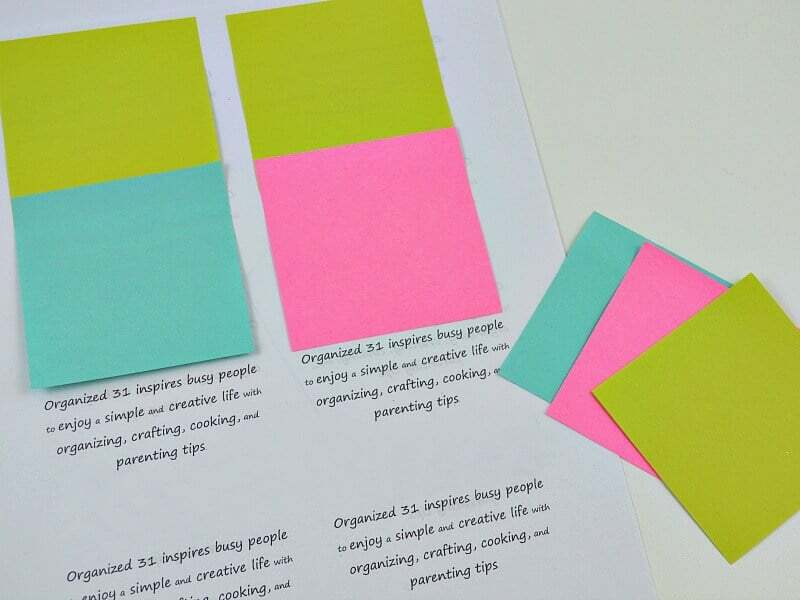 Who knew that printing on sticky notes could be so easy? 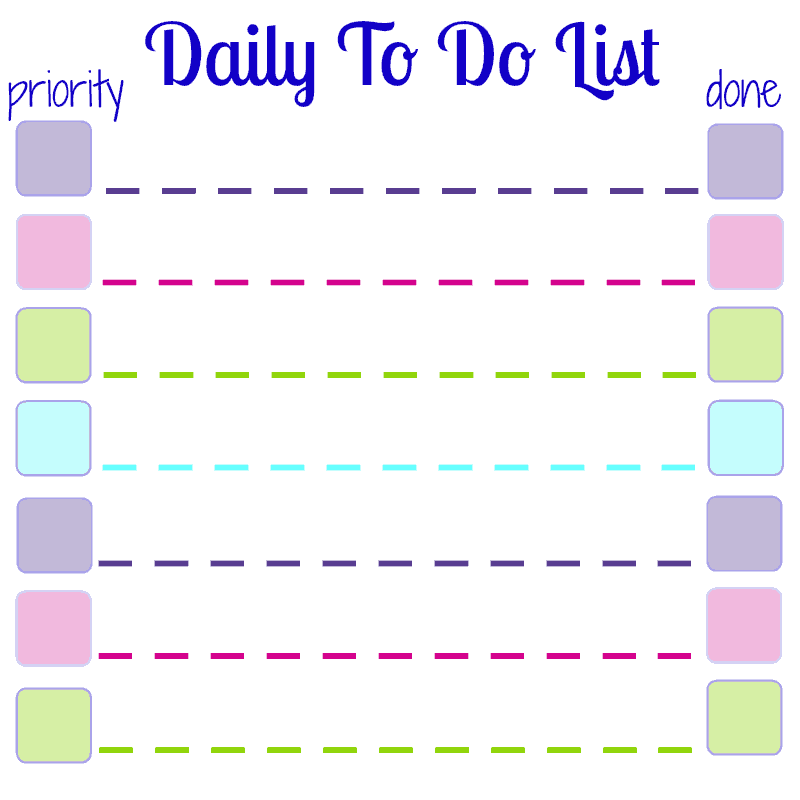 Check out the Daily To Do List Printable for sticky notes that I created for you and me. I use these daily and lo-ove them. You can print out your own on sticky notes right now and start using them today. I can’t wait to create more of my own personalized notes for all kinds of uses. I’m so excited now that I know how to print on sticky notes. I would have never thought to print on sticky notes. I love this idea. I have recently began to use more sticky notes as reminders. This would work perfectly for me.. I love this! I adopted your editorial calendar format last year and this is going to make it look so much nicer. Thanks for the idea! This is a great idea! I never thought of this before to be honest, but will give it a try! Thank you for sharing. It’s really easy to do and you’ll fall quickly become addicted. Such a great idea! I use sticky notes everywhere too. Ah, a sister sticky note addict. You’ll quickly become addicted to printing your own messages on them, too, Kristi. Neat idea! I never thought of printing on sticky notes. I have a friend who uses sticky notes for his calendar… I bet he would love this. Sometimes you just want the note to look professional, right? Exactly, Seana, especially if you have terrible handwriting like mine. I am kind of obsessed with post-its! I use a ridiculous amount of them, and make no apologizes, haha. I love this idea of printing on them — thanks for the tutorial! This is a fantastic idea. When I working corporately I used Outlook Calendar to keep track of meetings etc. But tasks and deadline were Iput in a more portable paper calendar. Now that I am blogging I rely totally on my Paper Calendar, this is an awesome idea. Pinning. Thank you for the share.